The combination of meatballs and pasta can be made in so many different ways. Today, we're combining delicately flavored meatballs simmered in tomato sauce which are combined with piping hot rigatoni pasta. This Italian preparation can be easily cooked with a handful of ingredients. One can opt for a preferred red meat variety though I'll recommend beef to get the best results. Similarly, rigatoni can be replaced by your favorite pasta variant. Use generous amount of extra virgin olive oil to get a rich flavor. You can moderate the spice level too as per your taste. So, let's make this extremely delicious pasta and meatballs recipe to delight and surprise our family and friends. 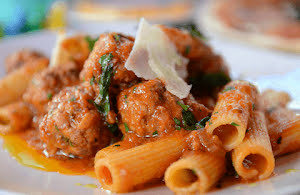 Savor this delicious Italian pasta preparation made with rigatoni and meatballs cooked in flavorful tomato sauce which gives it a delicate taste and aroma. Take a large bowl and add ground meat, parsley, garlic, whipped egg, ground pepper, and salt in it. Mix all the ingredients and shape the seasoned meat into medium-sized meatballs. Heat enough olive oil in a heavy base skillet to half dip the meatballs. Fry all the meatballs on a low flame till the surface turns light brown from all the sides. There's no need to place these meatballs on a paper towel as the grease adds to the flavor. Leave about half a cup of oil used for frying the meatballs in the same skillet. Add both onion and celery and sauté for about 3 to 4 minutes on a medium flame. Add pureed tomatoes and season with salt and pepper. At this stage, one can also add dried herbs like rosemary (optional) to elevate the flavor. Finally add meatballs and simmer for about 45 minutes on a low flame stirring twice or thrice at equal intervals. Add basil leaves and stir gently. Boil rigatoni in salted water until al dente. Add the cooked pasta in the piping hot tomato sauce and simmer for 2 minutes. Top it with sheets (or in grated form) of Parmesan cheese.